While smart and automated technologies are slowly taking over our lives, ranging from smart homes and self-driving cars to applet-generators like IFTTT, it sometimes feels like biotech is not catching up. With experiments becoming ever more complex and datasets more immense, a question that comes to mind is — can we automate life science? Compared with manufacturing and service industries, the life science R&D sector in general is lagging behind in terms of using automation for productivity and quality improvements. 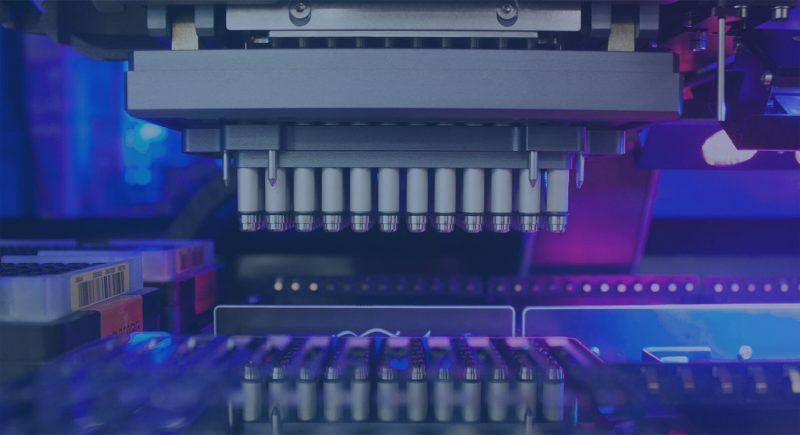 Most pharma and biotech companies, and in part also academic labs, have automated parts of their processes and make use of liquid-handling systems, especially those pursuing high-throughput screenings. When talking about earlier stages of basic research the situation gets more complex. Research questions often need to be adapted and there are few possibilities of standardizing experimental workflows. Then again, the potential of automation becomes clear when looking at the structures in academia. Here, PhD students are commonly the workhorses of the lab, often becoming absorbed in repetitive pipetting tasks that keep them from spending time on the actual science. On top of that, most researchers are still using handwritten lab notebooks. In laboratories, we still think like we did twenty, thirty years ago. We still think of the same processes. It’s amazing to see that if you go to the laboratory, how much paper is still being used on very basic stuff.” says Peter Boogaard, CEO and founder of the service company Industrial Lab Automation. So maybe it’s time to rethink the current workflows and realize that this is an area with serious room for improvement. In this article, we had a look at what’s going on in the field of automation for life sciences. 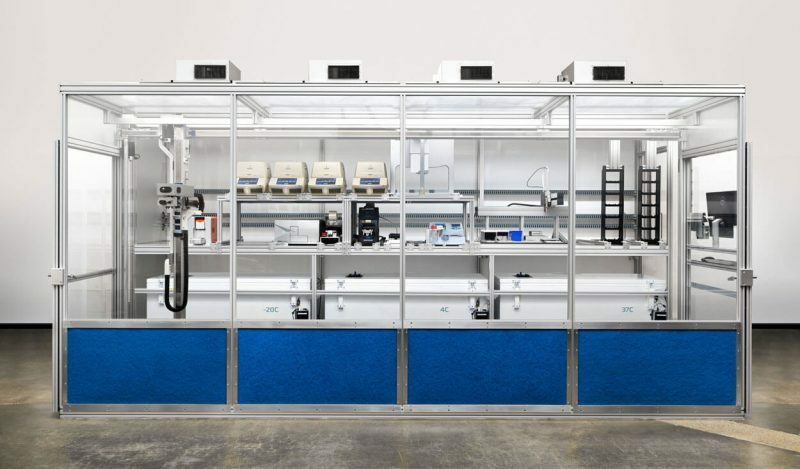 Having a fully automated lab means replacing human-driven lab processes with robots or other devices and using computers to monitor experiments and integrate the data. This upgrade would not only enhance productivity, but also increase reproducibility and accuracy. But do we really need this? A recent Nature survey indicated that science is indeed facing a reproducibility crisis. Of 1,576 researchers, more than 70% of respondents have tried and failed to reproduce another scientist’s experiments. More than half have failed to reproduce their own. Another study published in PLoS Biology estimated the amount of money spent on not reproducible preclinical research at a massive $28B in the US alone. Synbio companies are probably most advanced when it comes to lab automation. Using software and hardware automation, some of these companies are aiming to transform the process of organism engineering — replacing technology with biology. Founded by Tom Knight, the godfather of synthetic biology, together with four of his graduate students, Ginkgo Bioworks was started with the dream of making biology easier to engineer. The company designs and optimizes organisms to efficiently produce compounds according to the customer’s desire. Today, the US company has build several ‘foundries,’ factories where every step of strain engineering, from molecular biology to high-throughput analytics to small-scale fermentation has been automated. Running about 15,000 automated operations per month, the so called ‘organism engineers’ can build and test thousands of new prototypes for each project. Through building such automation tools, the company has significantly scaled up its throughput and capacity. In Europe, British LabGenius is another synbio company that uses AI and automation together with its proprietary gene synthesis technology to rapidly search through trillions of genetic designs to find new biological solutions and create novel compounds. Some might argue that the synthetic biology field is an area where biology and engineering coalesce. As Ginkgo describes it itself, “we aren’t trying to study biology, we are trying to build it.” But what about those trying to study it? Liquid handling systems and pipetting robots have been around for a while, but most of them are simply too expensive for most laboratory settings. Also, they often require trained personel to program the systems according to the specifics of the experiment. Opentrons believes it can make wet lab experiments faster, cheaper and more reproducible by providing access to low-cost liquid-handling robots. “Basically, if you’re a biologist you spend all of your time moving tiny amounts of liquid around from vial to vial by hand with a little micro-pipette or you have a $100,000 robot that does it for you. We’re a $3,000 robot,” explained OpenTrons co-founder Will Canine to TechCrunch. Not only are they aiming to make these machines more affordable, they are also trying to make them more intuitive. The machine is controlled by the web browser and allows researchers to download protocols from the cloud to run experiments. Taking it one step further, London-based Synthace, is developing Antha, a technology, which they describe as “a programming language for biology”. 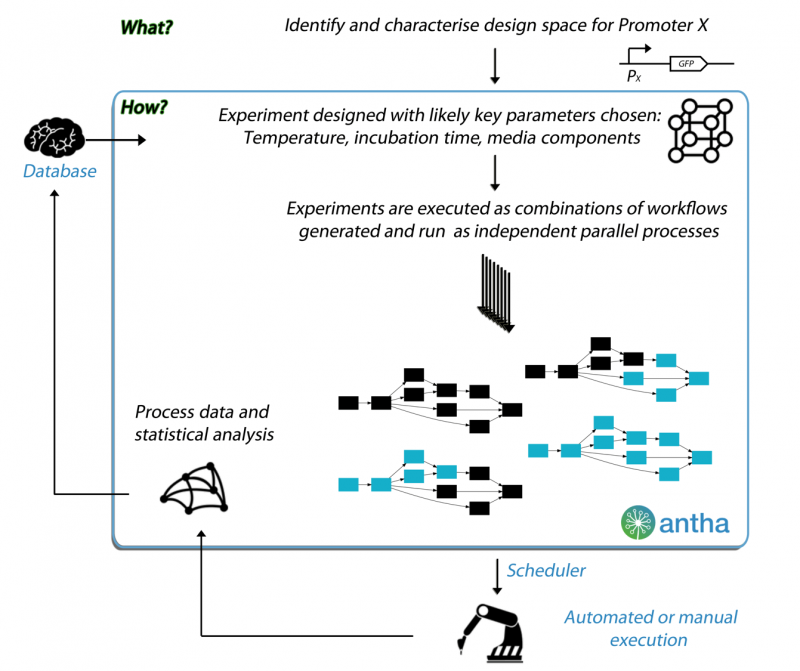 Antha represents a software interface connecting hardware with the wetware in the lab, and it has been designed to make simple workflows of experimentation. It allows a researcher to build a protocol and then communicate it to his lab equipment. Its Opentrons robot, for example, could conduct the experiment. Using the Antha programming language, it is possible to initiate a design, generate workflows, schedule experiments on various machines, and interpret the results from one platform. Fracchia believes that the solution to the reproducibility crisis is augmentation, not necessarily automation. He founded the company BioBright, which offers a suite of software, hardware, and services to turn laboratories into ‘smart labs’. BioBright’s tools enable automated data collection, using sensors, cameras and a simple raspberry pi computer. The system also interfaces with the lab equipment. “We developed the first temperature sensor that fits in an Eppendorf tube,” said Fracchia in an MIT article. BioBright’s Darwin voice assistant enables researchers to issue voice notes instead of stopping to write down information manually. According to Fracchia, the system functions as a self-writing notebook, generates a reliable record and thereby eliminates human error. Automation alone might not be the sole solution to make research more efficient and reproducible, yet the innovations described above show that advances in the field of AI could have the potential to change current paradigms of the lab. Fracchia describes in a recent interview how he envisions scientists to wear lenses, that project holograms describing the content of our test tube. He and Knight and all the others believe that research in the life sciences can be transformed. Ultimately, such a transformation could boost the overall efficiency and quality of research and help to accelerate the field of life sciences even further. CO-AUTHORED WITH RAPHAEL FERREIRA. Raphael has a master’s degree in synthetic and systems biology from Université Paris Diderot & Université Paris Descartes in France. He did his MSc project in the field of synthetic biology at the NASA Ames Laboratory in the US. He’s currently doing a Ph.D focusing on CRISPR technologies in Jens Nielsen’s lab at Chalmers University.